Senior Eva Buciek, freshman Amy Leslie and sophomore Islay Fossett after a match. Photo courtesy of Amy Jensen. 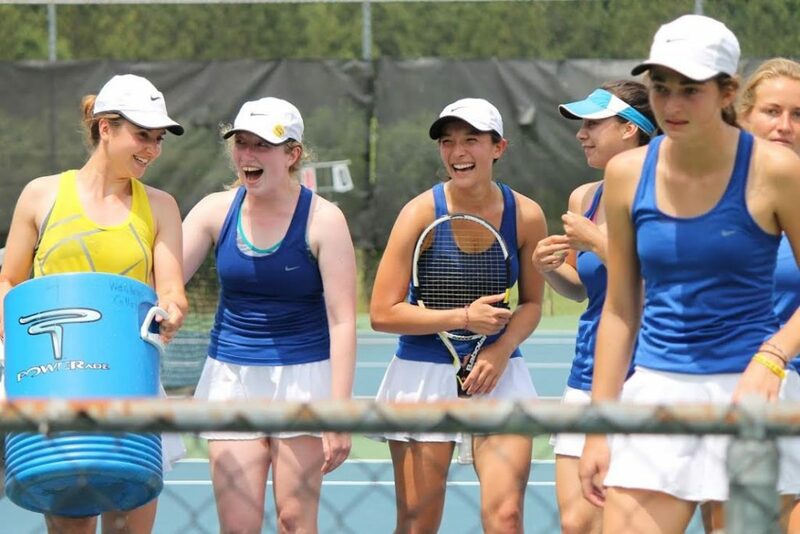 UC Santa Cruz women’s tennis fell 5-0 to Lewis and Clark College in the first round of the 2016 NCAA Division III National Championships last Friday at the Biszantz Family Tennis Center in Claremont. UCSC lost all three doubles rounds. Sylvia Brummitt and Stephanie Graziano fell 8-0 in No. 1 doubles, Ashley Brudzinski and Islay Fossett 8-3 in the No. 2 spot and Melanie Waechtler and Amy Leslie 8-0 in the third spot match-up. In the singles competition, Aurora Garrison defeated Fossett 6-0 and 6-1. Leslie was also swept 6-0 in two straight sets. The final four singles matches went unfinished, as the two singles wins gave No. 18 Lewis and Clark the five wins it needed to advance to the second round of the NCAA tournament. Lewis and Clark lost in the second round to No. 3 Pomona-Pitzer. Despite the team’s early exit, UCSC head coach Amy Jensen is proud of the Slugs’ efforts this season. While some programs carry upward of 15 players on their roster, UCSC carried nine this year. With one senior graduating, Jensen will add five or six new players to boost the young roster next year. For the second straight year, UC Santa Cruz men’s tennis fell 5-0 last Saturday in the second round of the NCAA tournament to Claremont Mudd-Scripps (CMC), the 2015 Division III National Champions. “We played the second best team in the country, and they were much better than us,” senior Kyle Richter said. The Slugs were one of three teams selected from true independents and schools in conferences that are unable to earn an automatic bid. They earned their spot after significant efforts this season as one of top-ranked independent programs in the country. All-American doubles pair Adrian Sirovica and Kyle Richter fell 8-4 to CMS’s Skyler Butts and Daniel Morkovine in a match-up of the No. 1 (CMS) and No. 5 (UCSC) doubles teams on the West Coast. Chad Stone and Ryan Dugan were defeated 8-5 in the No. 2 doubles match, while Chad Le Duff and Sean Hollister were defeated by Glenn Hull and Bryan Mehall. 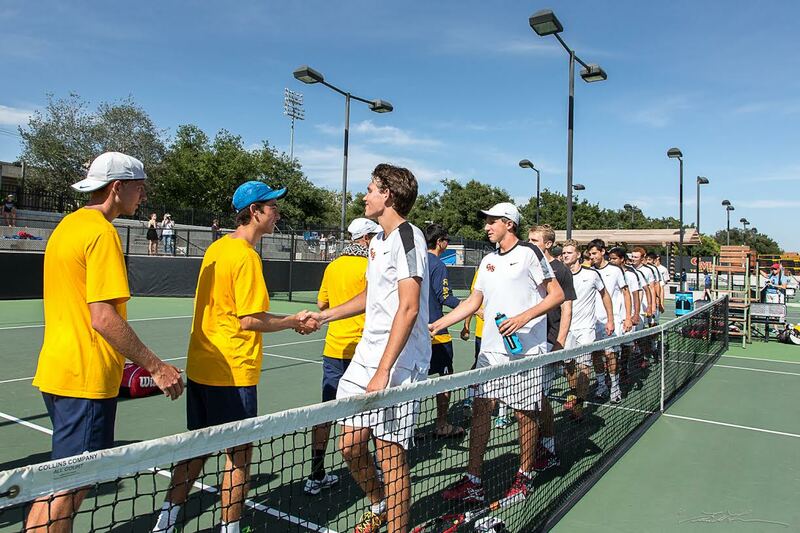 UCSC shakes hands with Claremont Mudd-Scripps after its second round defeat in the NCAA tournament. Photo courtesy of Ellen Friedlander. In singles, Stone fell 6-0, 6-1 to push CMS within a point of securing the fifth win needed to advance. Butts closed out the 5-0 win at No. 1 singles, 6-3, 6-4 against UCSC second-year Sirovica. CMS then defeated Texas-Tyler 5-4 in the third round and will head to Kalamazoo, Michigan on May 23 for the NCAA Team and Individual Championship.